Indian grass, Sorghastrum nutans, is a warm season, native, perennial grass which naturally occurs in prairies, glades and open woods. Found in all but five of the lower 48 states, it is adaptable to a wide variety of soils and, along with little bluestem, big bluestem and switchgrass, is an important species of the North American tallgrass prairie. It is a beautiful grass that is noted for its upright form, broad, blue-green foliage and striking bloom. 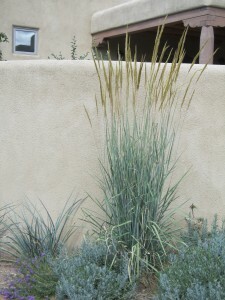 ‘Thin Man Indian Grass’ is a specially selected form of Indian grass which stays low, 2-3’ tall, for most of the summer then grows taller in fall, right before blooming. At this time the foliage changes color to orange-purple with the 5-6’ vertical flowering stems rising high above. On top the light brown flower panicles sway and abundant showy, yellow stamens give them an overall bronzy sheen. Going into winter, the fall color is somewhat retained and the flower heads darken as they age and go to seed. ‘Thin Man Indian Grass’ is especially tolerant of dry growing conditions, stands up to wind, and its narrow footprint, 2-2.5’ wide, makes it useful in large and small gardens alike. In larger spaces gardeners can use it en masse along with the Plant Select® ‘Standing Ovation’ little bluestem to create a prairie-like effect. In smaller spaces placing a few specimens here and there can provide dramatic, vertical accents. This tall clumping grass is a great companion for a wide range of flowering perennials such as those listed above but also including Tennessee purple coneflower (Echinacea tennesseensis), red birds in a tree (Scrophularia macrantha), and Engelmann’s daisy (Engelmannia peristenia). ‘Thin Man’ also supports local wildlife. Grasses are wind pollinated, however bees are attracted to the blossoms which produce abundant amounts of pollen. Songbirds and small mammals will feed on the seeds. And because of its height and tendency to remain upright, it provides nesting habitat and cover for birds, including pheasants and mourning doves, as well as native bees. A beautiful native drought tolerant grass with multi-season garden interest that is also a natural bird feeder. Is this plant ‘Thin Man Indian Grass’ growing anywhere in the Denver Botanic Gardens? Good question. I’ll look for it on Monday and let you know. Does anyone know where to buy this grass in the Denver area? It seems to be very hard to find. Is Sorghastrum Nutans , always Sorghastrum Nutans? I saw an Indian grass plant at a local nursery, but it was not specifically labeled as Thin Man. Is thin man a specific Indian Grass, or are they all Thin Man ? Great question! They are not all Thin Man. There are several selections of Sorgastrum nutans on the market. Thin man was selected for its increased drought tolerance, bluish foliage and upright habit.